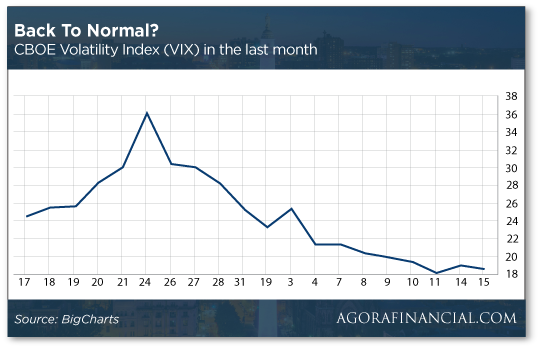 Who’s Afraid Of a Little Volatility? Volatility recedes — time to pounce! A “single defining issue” in the new American civil war? As we write this morning, the stock market looks as calm as it’s been since early December. 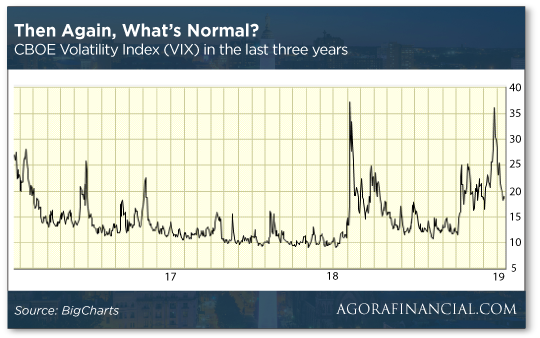 Then again, by the standards of the last three years, the VIX still looks elevated. The market more or less went to sleep during 2017… only to be rudely awakened in late January–early February last year. “One of the best times to buy is just after a huge volatility spike — like the one we saw in December,” says Alan Knuckman — our eyes and ears in the Chicago options trading pits. There’s no better proof than what happened after that shock nearly a year ago. The market raced up in January, only to give it all back in a mere six trading days. But after some “backing and filling” in the months that followed, the major stock indexes recovered to notch new highs by late summer and early fall. Alan sees a very similar setup right now… not that it’ll be a straight line up. “Much like big earthquakes, there will be aftershocks. And the range of trading will be high… We saw 700-plus-point swings in the Dow a few short days ago. “In current conditions, call options are my go-to way for trading high-volatility opportunities,” Alan says. “When traded correctly, call options limit your downside to only the amount of money it costs to enter the trade. “Plus, this is often significantly cheaper than buying shares of stock outright. And just because you’re paying less money to enter a trade than if you bought the shares doesn’t mean that your upside is limited. “Even better… since call options are a derivative of stocks, this leverage can lead to much higher returns than simply owning shares. There’s no better time to start using Alan’s options strategies than today, with quarterly earnings season underway. Let Alan show you how to seize on “January spikes” for big gains when you follow this link. The major U.S. stock indexes are posting gains on this first day of earnings season — the S&P 500 up three-quarters of a percent, the Nasdaq up 1.25%. But the Dow is lagging — up less than four-tenths of a percent, dragged down by the first Dow stock to report its quarterly numbers — JPMorgan Chase. JPM reported earnings growth of 67% yearoveryear. Unfortunately, the typical Wall Street analyst was expecting earnings growth of 110%. It’s the first time JPM has missed analyst estimates in four years. In early trade, JPM shares were down 2.5%… but at last check the day’s losses have been pared to less than 1%. Gold has slipped a bit to $1,289. But crude has roared up more than 2.5% today; a barrel of West Texas Intermediate is back within sight of last week’s $52 level. If the Federal Reserve is still looking for reasons to raise interest rates in March, they’re not showing up in the day’s economic numbers. Despite the “partial government shutdown,” the Labor Department issued the producer price index today. It says wholesale prices slipped 0.2% during December. Some of it was falling energy prices, but really wholesale inflation was tame across the board. Meanwhile, factory activity in New York state is now its slowest since May 2017. The Fed’s Empire State survey rings in at 3.9 for January — not much above the zero dividing line between a growing factory sector and a shrinking one. We’ll have a better idea whether this is a one-off on Thursday, when the Philly Fed survey gives us a snapshot of factory activity in the mid-Atlantic. In any event, the Fed has already made clear that further increases in the fed funds rate are over until further notice. The standard $11-a-month plan is rising to $13. All plans will rise by a buck or two. Pricing power, baby! Can’t say we’re surprised. This is the sort of thing that happens in the late boom phase of the boom-bust cycle. Netflix figures the typical customer is feeling flush enough that he or she might grumble but not cancel. (Probably right.) 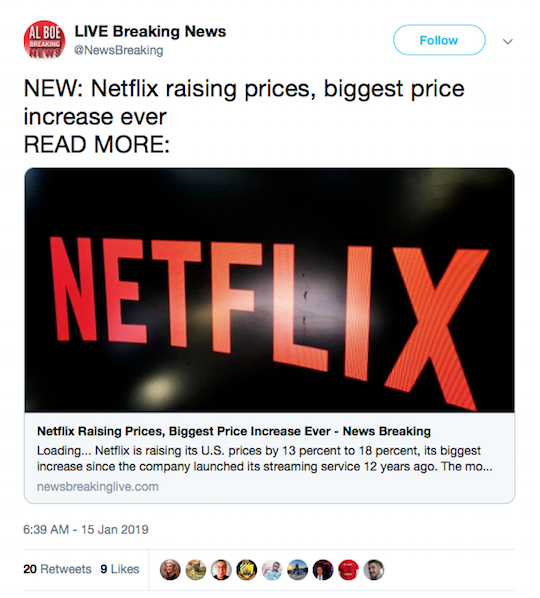 Too, NFLX needs the cash to offset the huge debt burden it’s taken on in hopes of dominating all of Hollywood. The Street loves it; NFLX shares are up more than 6% on the day. The stock sports a P/E ratio of 126 — which isn’t nearly as insane as the 280 level of last June, but is still anything but a bargain. With the 2019 Consumer Electronics Show now in the rearview, our tech maven Ray Blanco pronounces the event “more evolutionary than revolutionary”… and he’s OK with that. “Concepts and prototypes don’t make tech stocks money,” he explains. “Quality products that are accepted by consumers do. Revolutionary ideas need to evolve and mature in order to enter the mainstream. “And we saw plenty of that. Virtual reality and augmented reality devices have debuted in past years, but this year’s offerings were lighter, clearer and more power-efficient. “The same is true of the relentless competition to develop practical, safe autonomous-driving technology. Cars are on their way to becoming the most powerful computers people will own, bristling with high-technology present in sensors, processors, communication equipment and more. Exhibitor mock-up of typical components required for autonomous vehicles. 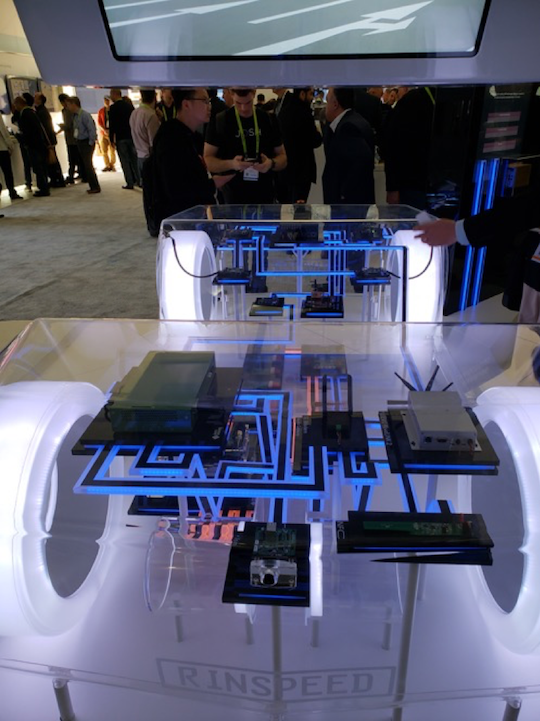 Speaking of 5G wireless… it didn’t make that big a splash on the exhibit floor in Vegas. “I suspect major names are waiting for the Mobile World Congress in Barcelona next month to unveil their latest 5G-compliant products,” Ray explains. For the most part, we’re indifferent to the shutdown… but one story crossing our desktop this morning is infuriating. With much of the IRS’ operations suspended, the agency is sending out automated nastygrams to taxpayers warning of asset seizures. Like Aaron Caddel, who owns a handful of bakeries in California. Last year, there was a mixup with his payroll processor; the IRS says it never got his employees’ withholdings for the second quarter. Caddel, the processor and the IRS have gone back and forth about it for months — annoying, for sure, but not unusual. Then Caddel got a computer-generated “Notice of intent to seize [levy] your property or rights to property” dated Dec. 24 — three days after the shutdown began. Alas, Caddel can’t talk back to the IRS computer — or, for that matter, a human being. “Right now, we’re reaching dial tones,” he tells The Intercept. Just when we thought our “new American civil war” thread was winding down, it turns out we veered onto a new tangent yesterday. “Dave,” a reader writes, “you state that you are having difficulty determining the root cause of the all-too-evident conflict in America today, even after you remove Trump from the equation. “I propose that the principal conflict results from two widely divergent worldviews: globalism and the levelling of society by the mandate for equality in all things versus individualism and the importance of merit. In the globalist view, socialism is the most desirable economic model, guaranteed income and increased taxes on the wealthy being but some of the pathways to achieve ‘equality.’ In direct contrast, America has always prided itself on individualism, using capitalism as its economic model. “The coalescing issues that are eluding you with regard to the civil war are really the same for both sides,” writes another — “it’s just that the ‘blame’ is misdirected. Look at the protesters on both sides; they are younger and older as well. “What both sides are protesting, without knowing, is this: Inflation, combined with stagnant wages, has kept blue collar, and some white collar, workers without the ability to buy a house, have kids, save for retirement, etc. “When 70% of working households live paycheck to paycheck, that pressure is enormous… combined with the elites getting richer by the second (and flaunting it), it is a recipe for revolt. Which is why, contrary to the first reader’s wishful thinking today about individualists versus socialists, we fear there will be no black hats or white hats in the looming conflict. Painful to think about. But absent that core defining issue I’ve been reaching in the dark to find — sorry, Supreme Court nominations and border walls don’t make the cut — that’s where it seems things are going. “Like everyone else, I can see trouble coming, even though I can’t foretell what forms it may take,” writes our final correspondent. “However, my response has been to move to Latin America, where I have learned Spanish and made a lot of friends. Hopefully, whatever may come to pass will not hit as hard down here. P.S. Earnings season is underway… and Alan Knuckman says the stage is set for some of the most lucrative trades all year. “January spikes” he calls them. In an extreme scenario, they could generate gains of up to $242,860. But even if they don’t, they could still pad your retirement portfolio nicely. Click here to see for yourself. Please note: With earnings season now in progress, this offer expires tonight at midnight.